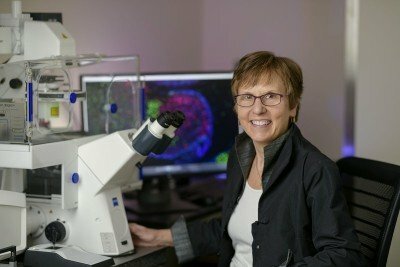 The Joyner lab studies how genes regulate the cell behaviors (proliferation, differentiation, migration) that underlie organ development, tissue repair and cancer. They focus on the brain where stem cells must produce hundreds of cell types at the right times and in the correct numbers, and the cells then migrate to the correct positions and synapse with partners. 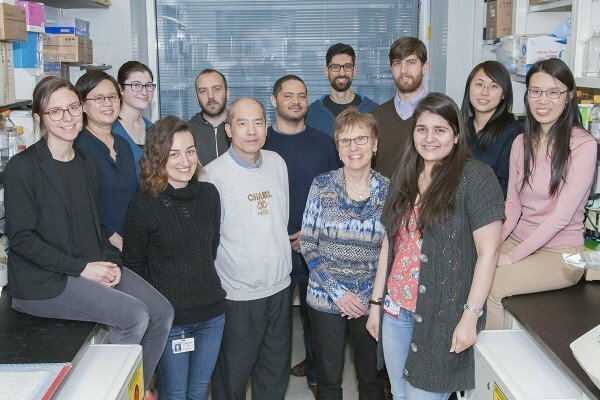 The lab uses sophisticated mouse genetics approaches to probe how cell-cell communication and cell intrinsic genetic programs determine the way by which normal cerebellar circuitry is established and regulates behaviors, or are disrupted in diseases including cancer. Developmental biologist Alexandra Joyner studies the involvement of Hedgehog signaling and transcription factors in cerebellum development, regeneration and cancer. Bayin N.S., Wojcinski A., Mourton A., Saito H., Suzuki N., Joyner A.L. (2018). Age-dependent dormant resident progenitors are stimulated by injury to regenerate Purkinje neurons. Elife. doi: 10.7554/eLife.39879. Roselló-Díez A., Madisen L., Bastide S., Zeng H., Joyner A.L. (2018). Cell-nonautonomous local and systemic responses to cell arrest enable long-bone catch-up growth in developing mice. PLoS Biol. doi: 10.1371/journal.pbio.2005086.